Halloween week is all about the pumpkin but I can’t resist cooking with another favorite squash of mine… the Red Kuri Squash. This lesser known variety is also called a Hokkaido, or a Uchiki Kuri in its place of origin, Japan. Its brilliant orange color and tear drop shape make it easy to identify in a pile of home-grown squash at Eckert’s. Red Kuri Squash happens to be a favorite of the classroom staff as well because it maintains good texture and shape when roasted. It also yields an incredibly creamy soup we often make for cooking classes in the fall and winter. 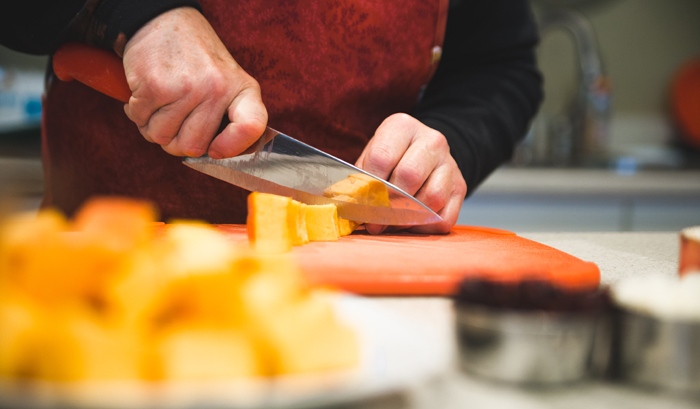 Years ago, our culinary instructors cooked with Red Kuri Squash during their international residencies in Japan and Germany, making this squash truly a global ingredient! Admittedly, I am a salad girl. I love to make and eat salads so when I saw this unusual line up of ingredients including the Red Kuri Squash, I immediately ran to the kitchen to give it a try. I started by cutting the squash in half and removing the seeds before dicing it in 3/4” pieces. Red Kuri can be difficult to peel, so I bypassed peeling and roasted this squash in the skin. Once cooked, Kuri Squash skin is very tender and edible. Roasted pistachios, simple seasonings, cooked quinoa and fresh spinach round out the textures and flavors in this delicious fall salad. When you find yourself looking for a yummy salad guaranteed to start a discussion about a lesser known squash, I hope you will give this recipe a try! Position an oven rack in the center of the oven and preheat to 400-degrees F. Line a rimmed baking sheet with foil and set aside. Place the squash in a medium or a 3-quart bowl and add 3 Tbs. of the oil, the thyme, ½ tsp. of salt and season with pepper to taste. Mix until the squash is well coated. Transfer to the prepared baking sheet and spread squash out into a single layer. Roast until a paring knife slides into the squash with no resistance, about 30 minutes, stirring about halfway through the cooking time. Put the pistachios on a small baking sheet and toast until fragrant, about 5 minutes. Set both aside. Meanwhile, to remove bitter taste of quinoa, rinse quinoa under cold running water in a fine-mesh strainer. In a 3-quart saucepan, bring the broth or water to a boil and stir in quinoa. Simmer, uncovered, until a small white spiral becomes visible in each grain, about 9 to 12 minutes. If there appears to be liquid in the pan, drain the quinoa and transfer it to a large (4-quart) bowl. Add the remaining 2 Tbs. olive oil, the pistachios, cranberries, vinegar, ½ tsp. salt and pepper to taste. 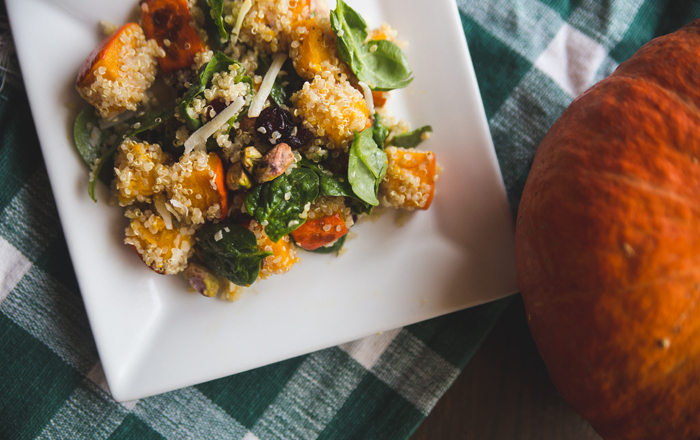 Toss the spinach in with the warm quinoa and the warm squash. Spinach will wilt slightly. Sprinkle with cheese. Serve warm or at room temperature.